Rough nights for Josh Roenicke and Rex Brothers, who each allowed two runs in their outing. Roenicke was victimized by Chris Young's monster two-run homer in the 5th. Brothers was unable to handle left-handed hitters (Jason Kubel doubled, Miguel Montero singled home two) in his one inning. Turning Point: The Rockies were never going to compete in this game unless the offense stepped up, but if I had to look at one sequence that kinda told us where this game was going, it was Miguel Montero's 13-pitch at-bat in the second inning that ultimately resulted in a single. It didn't lead to a run, but Cabrera ended up throwing 33 precious pitches in the inning. When you know going in you only have around 75-80 to work with, an at-bat/inning like that changes your whole outlook. Cabrera was never able to get it all together afterwards, though he did show some promising survivor skills in a couple spots. 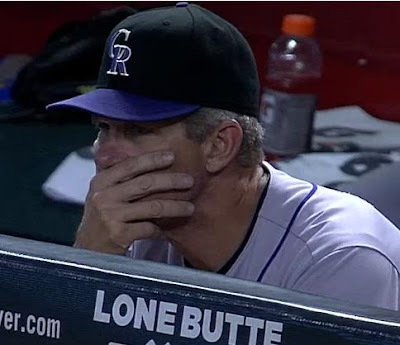 That's exactly how I watch most Rockies games. Highlight of the Night: As I mentioned, Michael Cuddyer was the offense tonight with a couple of no doubt home runs. The second of which was a freakin' missile that exited Chase Field in a spot you don't see very often. What's Next: The Rockies have a chance to not be swept on Wednesday. It all depends on how well Jeff Francis (2-2, 5.24) bounces back from his stinker in San Diego, and how well they can handle Trevor Cahill's (8-8, 3.77) sinker. Tune in at 7:40 to see what happens!